Albert Einstein ranks as one of the most remarkable theoreticians in the history of science. During a single year, 1905, he produced 5 papers, 3 of which are among the most important in 20th-century physics, and perhaps in all of the recorded history of science, for they revolutionized the way scientists looked at the nature of space, time, and matter. These papers dealt with the nature of particle movement known as Brownian motion, the quantum nature of electromagnetic radiation as demonstrated by the photoelectric effect, and the special theory of relativity. Although Einstein is probably best known for the last of these works, it was for his quantum explanation of the photoelectric effect that he was awarded the 1921 Nobel Prize in physics. In 1915, Einstein extended his special theory of relativity to include certain cases of accelerated motion, resulting in the more general theory of relativity. Einstein was born in Ulm, Germany, on March 14, 1879, the only son of Hermann and Pauline Koch Einstein. Both sides of his family had long-established roots in southern Germany, and, at the time of Einstein's birth, his father and uncle Jakob owned a small electrical equipment plant. When that business failed around 1880, Hermann Einstein moved his family to Munich to make a new beginning. A year after their arrival in Munich, Einstein's only sister, Maja, was born. 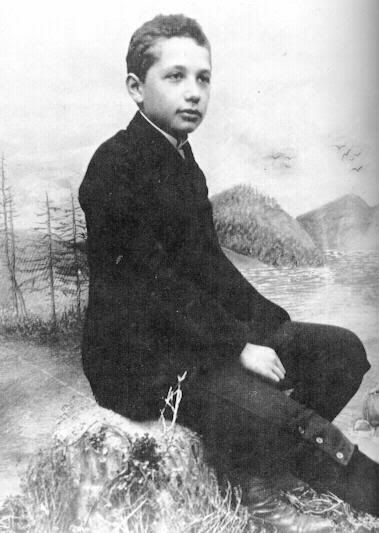 As a child, Einstein was anything but advanced--he did not even speak until he was three years old. When he did speak, he had so much trouble that his parents thought that he might be intellectually impaired. When he was five, Einstein was sent to a Catholic elementary school, although his family was Jewish. At age 10, he was enrolled in the Luitpold Gymnasium in Munich. In 1894, Hermann Einstein's business failed again, and the family moved once more, this time to Pavia, near Milan, Italy. Einstein was left behind in Munich to allow him to finish school. Such was not to be the case, however, since he left the gymnasium after only six more months. 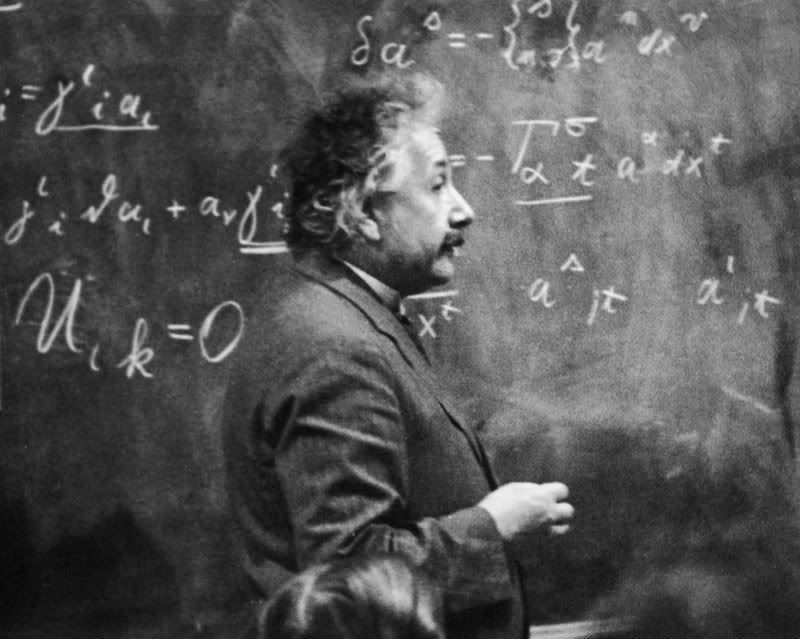 Einstein was interested only in mathematics, and he did especially poorly in Latin and Greek. Einstein's biographer, Philipp Frank, explains that Einstein so thoroughly despised formal schooling that he devised a scheme by which he received a medical excuse from school on the basis of a potential nervous breakdown. He then convinced a mathematics teacher to certify that he was adequately prepared to begin his college studies without a high school diploma. Other biographies, however, say that Einstein was expelled from the gymnasium on the grounds that he was a disruptive influence at the school. When he left, one of his teachers told him he would never amount to much. The program at ETH, however, had barely any more appeal for Einstein than did his schooling in Munich. He apparently hated studying for examinations and was not especially interested in attending classes on a regular basis. He devoted much of this time to reading on his own, specializing in the works of Gustav Kirchhoff, Heinrich Hertz, James Clerk Maxwell, Ernst Mach, and other classical physicists. With the help of a friend’s lecture notes, Einstein graduated with a teaching degree in 1900. Unable to find a permanent job, Einstein supported himself as a tutor in a private school in Schaffhausen. In 1901, Einstein also published his first scientific paper, "Consequences of Capillary Phenomena." 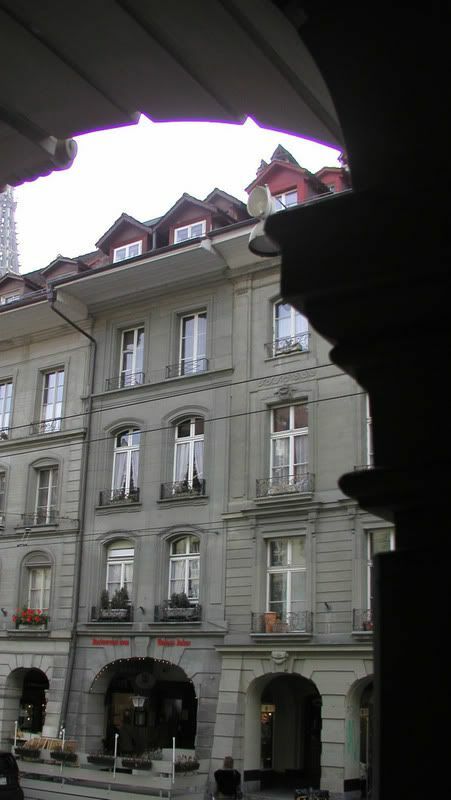 In February, 1902, Einstein moved to Bern and applied for a job with the Swiss Patent Office. He was given a probationary appointment to begin in June of that year and was promoted to the position of technical expert, third class, a few months later. The seven years Einstein spent at the Patent Office were the most productive years of his life. The demands of his work were relatively modest and he was able to devote a great deal of time to his own research. The promise of a steady income at the Patent Office also made it possible for Einstein to marry. 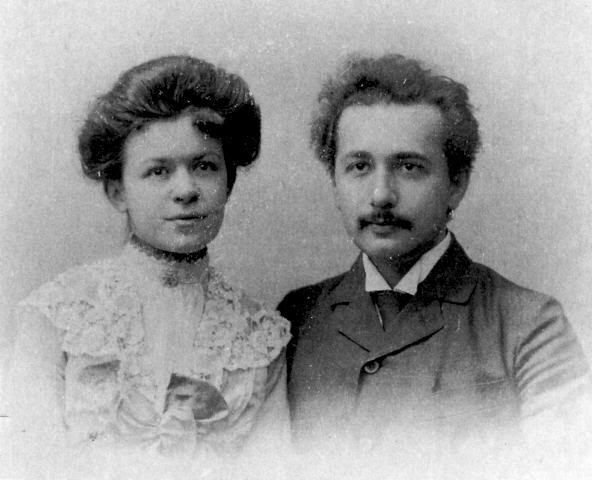 Mileva Maric (also given as Maritsch) was a fellow student in physics at ETH, and Einstein had fallen in love with her even though his parents strongly objected to the match. Maric had originally come from Hungary and was of Serbian and Greek Orthodox heritage. The couple married on January 6, 1903, and later had two sons, Hans Albert and Edward. A previous child, Liserl, was born in 1902 at the home of Maric's parents in Hungary, but there is no further mention or trace of her after 1903 since she was given up for adoption. In 1905, Einstein published a series of papers, any one of which would have assured his fame in history. One, "On the Movement of Small Particles Suspended in a Stationary Liquid Demanded by the Molecular-Kinetic Theory of Heat," dealt with a phenomenon first observed by the Scottish botanist Robert Brown in 1827. Brown had reported that tiny particles, such as dust particles, move about with a rapid and random zigzag motion when suspended in a liquid. Einstein hypothesized that the visible motion of particles was caused by the random movement of molecules that make up the liquid. He derived a mathematical formula that predicted the distance traveled by particles and their relative speed. This formula was confirmed experimentally by the French physicist Jean Baptiste Perrin in 1908. Einstein's work on the Brownian movement is generally regarded as the first direct experimental evidence of the existence of molecules. A second paper, "On a Heuristic Viewpoint concerning the Production and Transformation of Light," dealt with another puzzle in physics, the photoelectric effect. First observed by Heinrich Hertz in 1888, the photoelectric effect involves the release of electrons from a metal that occurs when light is shined on the metal. The puzzling aspect of the photoelectric effect was that the number of electrons released is not a function of the light's intensity, but of the color (that is, the wavelength) of the light. To solve this problem, Einstein made use of a concept developed only a few years before, in 1900, by the German physicist Max Planck , the quantum hypothesis. Einstein assumed that light travels in tiny discrete bundles, or "quanta," of energy. The energy of any given light quantum (later renamed the photon), Einstein said, is a function of its wavelength. Thus, when light falls on a metal, electrons in the metal absorb specific quanta of energy, giving them enough energy to escape from the surface of the metal. But the number of electrons released will be determined not by the number of quanta (that is, the intensity) of the light, but by its energy (that is, its wavelength). Einstein's hypothesis was confirmed by several experiments and laid the foundation for the fields of quantitative photoelectric chemistry and quantum mechanics. As recognition for this work, Einstein was awarded the 1921 Nobel Prize in physics. A third 1905 paper by Einstein, almost certainly the one for which he became best known, details his special theory of relativity. In essence, "On the Electrodynamics of Moving Bodies" discusses the relationship between measurements made by observers in two separate systems moving at constant velocity with respect to each other. Einstein's work on relativity was by no means the first in the field. 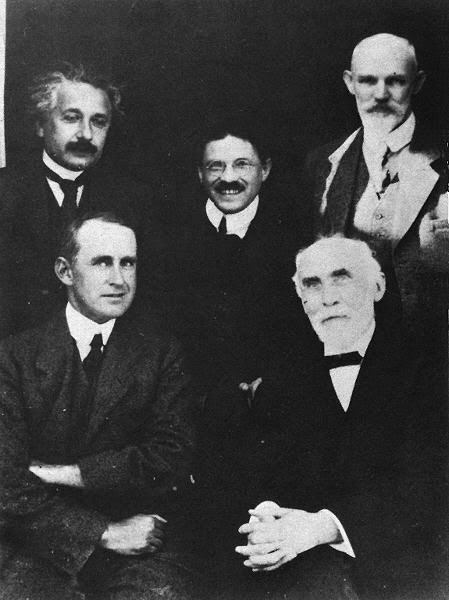 The French mathematician and physicist Jules Henri Poincaré, the Irish physicist George Francis FitzGerald, and the Dutch physicist Hendrik Lorentz had already analyzed in some detail the problem attacked by Einstein in his 1905 paper. Each had developed mathematical formulas that described the effect of motion on various types of measurement. Indeed, the record of pre-Einsteinian thought on relativity is so extensive that one historian of science once wrote a two-volume work on the subject that devoted only a single sentence to Einstein's work. Still, there is little question that Einstein provided the most complete analysis of this subject. He began by making two assumptions. First, he said that the laws of physics are the same in all frames of reference. Second, he declared that the velocity of light is always the same, regardless of the conditions under which it is measured. Using only these two assumptions, Einstein proceeded to uncover an unexpectedly extensive description of the properties of bodies that are in uniform motion. For example, he showed that the length and mass of an object are dependent upon their movement relative to an observer. He derived a mathematical relationship between the length of an object and its velocity that had previously been suggested by both FitzGerald and Lorentz. Einstein's theory was revolutionary, for previously scientists had believed that basic quantities of measurement such as time, mass, and length were absolute and unchanging. Einstein's work established the opposite--that these measurements could change, depending on the relative motion of the observer. In addition to his masterpieces on the photoelectric effect, Brownian movement, and relativity, Einstein wrote two more papers in 1905. One, "Does the Inertia of a Body Depend on Its Energy Content?," dealt with an extension of his earlier work on relativity. He came to the conclusion in this paper that the energy and mass of a body are closely interrelated. Two years later he specifically stated that relationship in a formula, E=mc2 (energy equals mass times the speed of light squared), that is now familiar to both scientists and non-scientists alike. His final paper, the most modest of the five, was "A New Determination of Molecular Dimensions." It was this paper that Einstein submitted as his doctoral dissertation, for which the University of Zurich awarded him a Ph.D. in 1905. Fame did not come to Einstein immediately as a result of his five 1905 papers. He submitted his paper on relativity to the University of Bern in support of his application to become a privatdozent (unsalaried instructor). However, the paper and application were rejected. His work was too important to be long ignored, though, as his second application three years later was accepted. 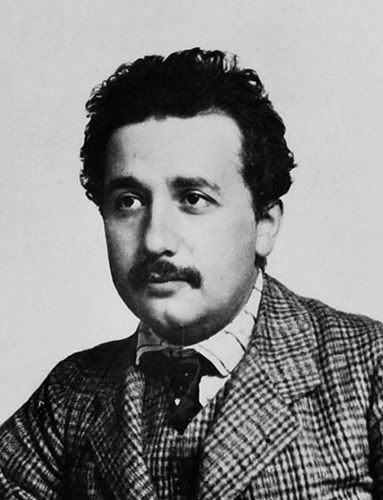 Einstein spent only a year at the University of Bern, however, before taking a job as professor of physics at the University of Zurich in 1909. He then went on to the German University of Prague for a year and a half before returning to Zurich and a position at ETH in 1912. A year later, Einstein was made Director of Scientific Research at the Kaiser Wilhelm Institute for Physics in Berlin, a post he held from 1914 to 1933. In recent years, the role of Mileva Einstein-Maric in her husband's early work has been the subject of some controversy. The more traditional view among Einstein's biographers is that of A. P. French in his "Condensed Biography" in Einstein: A Centenary Volume. French argues that although "little is recorded about his [Einstein's] domestic life, it certainly did not inhibit his scientific activity." In perhaps the most substantial of all Einstein biographies, Philipp Frank writes that "For Einstein life with her was not always a source of peace and happiness. When he wanted to discuss with her his ideas, which came to him in great abundance, her response was so slight that he was often unable to decide whether or not she was interested." A quite different view of the relationship between Einstein and Maric is presented in a 1990 paper by Senta Troemel-Ploetz in Women's Studies International Forum. Based on a biography of Maric originally published in Yugoslavia, Troemel-Ploetz argues that Maric gave to her husband "her companionship, her diligence, her endurance, her mathematical genius, and her mathematical devotion." Indeed, Troemel-Ploetz builds a case that it was Maric who did a significant portion of the mathematical calculations involved in much of Einstein's early work. She begins by repeating a famous remark by Einstein himself to the effect that "My wife solves all my mathematical problems." In addition, Troemel-Ploetz cites many of Einstein's own letters of 1900 and 1901 (available in Collected Papers ) that allude to Maric's role in the development of "our papers," including one letter to Maric in which Einstein noted: "How happy and proud I will be when both of us together will have brought our work on relative motion to a successful end." The author also points out the somewhat unexpected fact that Einstein gave the money he received from the 1921 Nobel Prize to Maric, although the two had been divorced two years earlier. Nevertheless, Einstein never publicly acknowledged any contributions by his wife to his work. 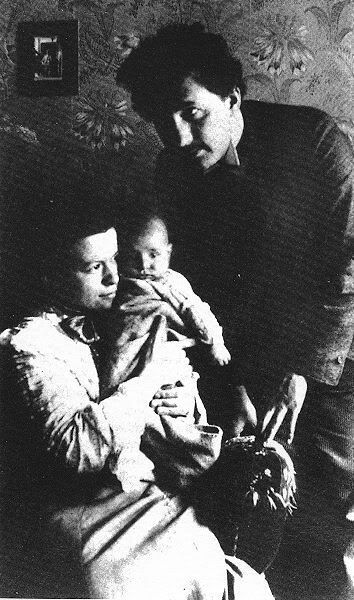 Any mathematical efforts Mileva Einstein-Maric may have contributed to Einstein's work greatly decreased after the birth of their second son in 1910. Einstein was increasingly occupied with his career and his wife with managing their household; upon moving to Berlin in 1914, the couple grew even more distant. With the outbreak of World War I, Einstein's wife and two children returned to Zurich. The two were never reconciled; in 1919, they were formally divorced. Towards the end of the war, Einstein became very ill and was nursed back to health by his cousin Elsa Löwenthal. 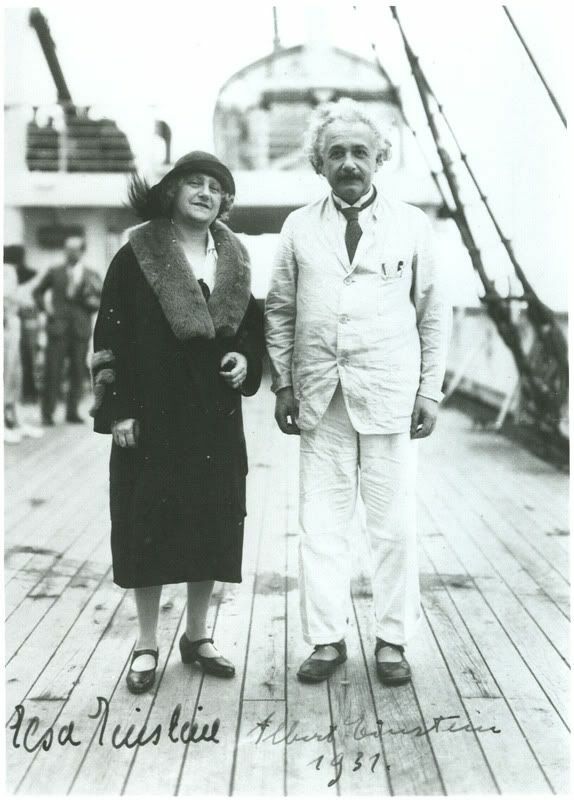 Not long after Einstein's divorce from Maric, he was married to Elsa, a widow. The two had no children of their own, although Elsa brought two daughters, Ilse and Margot, to the marriage. Elsa died in 1936. The war years also marked the culmination of Einstein's attempt to extend his 1905 theory of relativity to a broader context, specifically to systems with non-zero acceleration. Under the general theory of relativity, motions no longer had to be uniform and relative velocities no longer constant. Einstein was able to write mathematical expressions that describe the relationships between measurements made in any two systems in motion relative to each other, even if the motion is accelerated in one or both. One of the fundamental features of the general theory is the concept of a space-time continuum in which space is curved. That concept means that a body affects the shape of the space that surrounds it so that a second body moving near the first body will travel in a curved path. Einstein's new theory was too radical to be immediately accepted, for not only were the mathematics behind it extremely complex, it replaced Newton's theory of gravitation that had been accepted for two centuries. So, Einstein offered three proofs for his theory that could be tested: first, that relativity would cause Mercury's perihelion, or point of orbit closest to the sun, to advance slightly more than was predicted by Newton's laws. Second, Einstein predicted that light from a star will be bent as it passes close to a massive body, such as the sun. Last, the physicist suggested that relativity would also affect light by changing its wavelength, a phenomenon known as the redshift effect. Observations of the planet Mercury bore out Einstein's hypothesis and calculations, but astronomers and physicists had yet to test the other two proofs. Einstein had calculated that the amount of light bent by the sun would amount to 1.7 seconds of an arc, a small but detectable effect. In 1919, during an eclipse of the sun, English astronomer Arthur Eddington measured the deflection of starlight and found it to be 1.61 seconds of an arc, well within experimental error. The publication of this proof made Einstein an instant celebrity and made "relativity" a household word, although it was not until 1924 that Eddington proved the final hypothesis concerning redshift with a spectral analysis of the star Sirius B. This phenomenon, that light would be shifted to a longer wavelength in the presence of a strong gravitational field, became known as the "Einstein shift." Einstein's publication of his general theory in 1916, the Foundation of the General Theory of Relativity, essentially brought to a close the revolutionary period of his scientific career. In many ways, Einstein had begun to fall out of phase with the rapid changes taking place in physics during the 1920s. Even though Einstein's own work on the photoelectric effect helped set the stage for the development of quantum theory, he was never able to accept some of its concepts, particularly the uncertainty principle. In one of the most-quoted comments in the history of science, he claimed that quantum mechanics, which could only calculate the probabilities of physical events, could not be correct because "God does not play dice." Instead, Einstein devoted his efforts for the remaining years of his life to the search for a unified field theory, a single theory that would encompass all physical fields, particularly gravitation and electromagnetism. Since the outbreak of World War I, Einstein had been opposed to war, and used his notoriety to lecture against it during the 1920s and 1930s. With the rise of National Socialism in Germany in the early 1930s, Einstein's position became difficult. Although he had renewed his German citizenship, he was suspect as both a Jew and a pacifist. In addition, his writings about relativity were in conflict with the absolutist teachings of the Nazi party. Fortunately, by 1930, Einstein had become internationally famous and had traveled widely throughout the world. A number of institutions were eager to add his name to their faculties. In early 1933, Einstein made a decision. He was out of Germany when Hitler rose to power, and he decided not to return. Instead he accepted an appointment at the Institute for Advanced Studies in Princeton, New Jersey, where he spent the rest of his life. In addition to his continued work on unified field theory, Einstein was in demand as a speaker and wrote extensively on many topics, especially peace. The growing fascism and anti-Semitism of Hitler's regime, however, convinced him in 1939 to sign his name to a letter written by American physicist Leo Szilard informing President Franklin D. Roosevelt of the possibility of an atomic bomb. This letter led to the formation of the Manhattan Project for the construction of the world's first nuclear weapons. Although Einstein's work on relativity, particularly his formulation of the equation E=mc2, was essential to the development of the atomic bomb, Einstein himself did not participate in the project. He was considered a security risk, although he had renounced his German citizenship and become a U.S. citizen in 1940. An investigation was conducted by the FB in the late 40’s/early 50’sI regarding the Einstein’s affiliation with the Communist Party. Einstein was a member, sponsor, or affiliated with thirty-four communist fronts between 1937 and 1954. He also served as honorary chairman for three communist organizations. There are 1,427 pages of documentation that you can view online at the FBI’s official website. After World War II and the bombing of Japan, Einstein became an ardent supporter of nuclear disarmament. He also lent his support to the efforts to establish a world government and to the Zionist movement to establish a Jewish state. In 1952, after the death of Israel's first president, Chaim Weizmann, Einstein was invited to succeed him as president; he declined the offer. 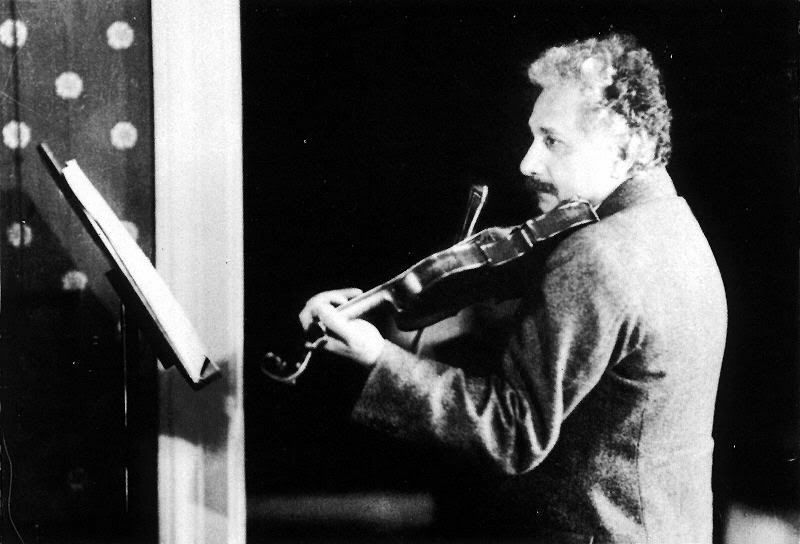 Einstein took his first violin lesson when he was 6 years old. His violin rarely left his side and he played it often, at an accomplished level, throughout his life, saying that "life without playing music is inconceivable to me". He played the violin in a trio on board ship in the 1930's on his way to the United States. Max Planck was also a highly gifted pianist, composer and singer. Lise Meitner once remembered a musical evening at the Plancks' house in Berlin, in which Planck, Einstein and a professional cellist played Beethoven's Piano Trio in B-flat major. "Listening to this was marvelously enjoyable, despite a couple of unimportant slips from Einstein... Einstein was visibly filled with the joy of the music and smiled in a light-hearted way that he was ashamed of his dreadful technique. Planck stood quietly by with a blissfully happy face and, hand on heart, said 'That wonderful second movement!' "
Einstein was an inveterate concert-goer. He attended the famous debut of Yehudi Menuhin with the Berlin Philharmonic under Bruno Walter, in which the 13-year-old Menuhin was soloist in a programme of the Bach, Beethoven and Brahms concertos that would be nowadays inconceivable. Einstein was so moved by Menuhin's playing that he rushed into the boy's room after the performance and took him in his arms, exclaiming "Now I know that there is a God in heaven!" He once said that had he not been a physicist, he would have been a musician: "I often think about music. I daydream about music. I see my life in the form of music." Albert Einstein received honorary doctorate degrees in science, medicine and philosophy from many European and American universities. During the 1920's he lectured in Europe, America and the Far East; and he was awarded fellowships or memberships of all the leading scientific academies throughout the world. He gained numerous awards in recognition of his work. Among the many honors given to Einstein were the Barnard Medal of Columbia University in 1920, the Copley Medal of the Royal Society of London in 1925, the Gold Medal of the Royal Astronomical Society in 1926, the Max Planck Medal of the German Physical Society in 1929, and the Franklin Medal of the Franklin Institute in 1935. Einstein died at his home in Princeton on April 18, 1955, after suffering an aortic aneurysm. At the time of his death, he was the world's most widely admired scientist and his name was synonymous with genius. Einstein declined to become enamored of the admiration of others. He wrote in his book The World as I See It: "Let every man be respected as an individual and no man idolized. It is an irony of fate that I myself have been the recipient of excessive admiration and respect from my fellows through no fault, and no merit, of my own. The cause of this may well be the desire, unattainable for many, to understand the one or two ideas to which I have with my feeble powers attained through ceaseless struggle." It was taken on Einstein’s 72nd birthday in Princeton on March 14, 1951 by a press photographer (Arthur Sasse). The original picture shows Einstein sitting on the backseat of a car between Dr Frank Aydelotte, the former head of the Institute for Advanced Study, and his wife. Albert Einstein and the Aydelottes were just returning from an event which had taken place in honour of Einstein. Einstein was, though already sitting in the car, still bullied by reporters and photographers. Becoming annoyed at their pushiness, he is said to have shouted: "That’s enough, that’s enough!" When these words didn’t hinder the photographers from requesting that he pose for a birthday picture, he stuck his tongue out at them. The photographer, Arthur Sasse, pressed the button of his camera in just this moment. Einstein liked the picture very much. He cropped it so that only he can still be seen. Then he had made several copies of it and sent the "manipulated" picture as a greeting card to friends later on. It is in this form that we know it today. A previous child, Liserl, was born in 1902 at the home of Maric's parents in Hungary, but there is no further mention or trace of her after 1903 since she was given up for adoption. Well, isn't that an interesting sentence. 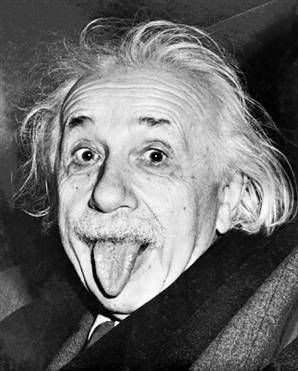 Liz, thanks for explaining the origin of that famous picture of Einstein sticking out his tongue! I also was not aware he played the violin! That line stood out for me in the book as well. That he could not marry Maric because he had no money at the time. Makes you wonder what names some of that Einstein DNA might be found in today escpeically since Maric also excelled at math. Their first son Hans Albert became a Professor of Hydraulic engineering and his second son, Eduard was afflicted with schrizophrenia. I read a very disturbing post on the internet in answer to whether any of Einsteins grandchildren were living. I worried that Einstein would be old news to everyone--but I just knew that there might be some things about him that some of you didn’t know. I discovered some things I didn’t know (even after my son did a report on him back in elementary school). But I found it interesting that there was not much information about his family other than the information that I found on his wives and children, which was pretty sketchy as it was. So this article is quite an eye-opener, gemini. Thanks for digging further. The man has always fascinated me. So it was great to have even more tidbits to read about him and his descendents. Liz wrote: I worried that Einstein would be old news to everyone--but I just knew that there might be some things about him that some of you didn’t know. I discovered some things I didn’t know (even after my son did a report on him back in elementary school). But I found it interesting that there was not much information about his family other than the information that I found on his wives and children, which was pretty sketchy as it was. I found it fascinating after reading that Einstein accused his first wife and daughter-in-law of having bad genes that he married Elsa who was his first cousin maternally and his second cousin paternally. There were "such significant faults of heredity in both families," Albert wrote of Mileva's and Frieda's families. Now he was saying that Frieda came from unhealthy stock, that she was 4 feet 11 inches tall due to dwarfism, that Frieda's mother was unbalanced (when reportedly she had an overactive thyroid). Hans Albert and Frieda married despite these protests and remained together until her death. Albert and Marić divorced on 14 February 1919, having lived apart for five years. On 2 June of that year, Einstein married Elsa Lowenthal (née Einstein), who had nursed him through an illness. Elsa was Albert's first cousin maternally and his second cousin paternally. Together the Einsteins raised Margot and Ilse, Elsa's daughters from her first marriage. Their union produced no children. Something else I read about Lieserl said that she might have had Down Syndrome. fansmom wrote: Something else I read about Lieserl said that she might have had Down Syndrome. Thanks fansmom. That was another fascinating article. Well, I'd rather read about relatives than relativity. Science has never really been my strong suit, so I knew very little about the man. Always learn SO MUCH from the tidbits here! Thanks for the info on Einstein, Liz. I sure didn't understand the science part, but it was very interesting to learn about Einstein's life. Fansmom, I’m with you. You’ll find that my questions in the discussion will focus more on philosophy or people than science. Frederic Golden wrote: But, like Zackheim, most people are slowly discovering that Einstein was not simply the secular saint they grew up with--the aureole-haired, sock-shunning professor who solved geometry problems for little girls, alerted F.D.R. to the German A-bomb peril and then wept over the destruction of Hiroshima and Nagasaki. Frederic Golden wrote: But it is critical for cultural iconography. Einstein reshaped our view of the universe. That he was a flawed human being is not only fascinating in a tabloid sort of way but reassuring as well. It makes our heroes, even those of unfathomable genius, seem a little more like us. This is important to remember too. And I’ll admit that I’m anything but perfect. Of course I’m not a genius or a hero and didn’t invent anything of significance. Thanks for the extra tidbit, fansmom. Thanks GG. I hope it airs here or becomes available on DVD. Oddly enough, it's also the birthday of Sylvia Beach, the founder of Shakespeare & Company, the bookstore in Paris that we read about in A Moveable Feast.